After the maiden voyage to put the SS Explorer in the water and air her out in the Sea of Fables, I put my mind to sailing through Winterfell. One day I decided to take her from my retreat in the woods at Ebonshire down to my seaside retreat on Cape Wrath. I had anchored the Explorer on the river in front of my Ebonshire cottage and one fine morning we set out for Wrath, a sail through the heart of Winterfell. But I began with a detour. Storisende is right there. It is my neighbor. I can see her waters from my window. So I turned the Explorer around and passed into Storisende even though I knew there would be trouble. To start a journey with almost a guarantee of difficulties is not my usual choice but I figured I’d always have an excuse not to tangle with Storisende so I might as well get it over with now. There was trouble and right away. Storisende is a magical place tucked just inside a magical place. It sits, out of sight and therefore out of mind for most, in the northwestern corner of Winterfell. It is one of those places in which time stands still. It is always night there – a time of the mysterious, the unexpected, the unknown. A quiet place in a quiet time. The ship acted strangely in these waters as if haunted. There were moments when I thought the trip would be over before it had even started. But I persisted. It was all I could do to take her around for a quick look at the island and get out of there and back into Ebonshire. I travelled west on the river to the edge of Ebonshire, turned ‘round and headed east. This was a week before the recent snowfall. The grass was green, the fall colors were full, Winterfell was beautiful. …On into Eventide where Admiral Beaumont’s ships stood majestically in the twilight breeze. This trip took place more than a week before the recent attack, all was quiet and peaceful. I brought the Explorer ‘round Wolfwood Island so I could pass by my house which sits in Laudanum, just over the southern border of Eventide. When I reached the house I paused for a time to make a photograph, a momento of this maiden voyage through Winterfell. We then proceeded into the waters of the channel, headed south. Such activity and changes in these southern towns! On my left, the new Abbey and Chapel in Anodyne, established by Mr. Weyland. Into Laudanum now with several new shops to my right and to my left across the way in Absinthe as well. A small boat approached from the south and came quite close to my port side, too close for comfort as I was trying to stay clear of the Winterfell Ferry on the starboard. “Ahoy, Sir!” shouted the pilot, who was alone. “Ahoy!” I gave back. The gentleman stated it was his first visit to Winterfell and he asked for a recommendation on a course to set for taking in the fall colors. I directed him up through Winterfell prime and to the northern regions from whence I had just come and we parted. Now it was south through the picturesque Nepenthe Gate and into the Caledonian waters of Cape Wrath. I had heard the fort had been dismantled but it was odd to see it gone. I also took note that the local Cape Wrath Ferry Line had ceased operation though I saw a Caledon Ferry, the national line, steam past in the distance. I carefully navigated by the high rock island and straight for the dock at Whitfield Point. It was a bit of a trick to bring the Explorer to a good spot to rest here but I did so and we dropped anchor. I reached for my flask and sipped and watched the sun set for a bit. I have decided to leave the Explorer beside my home in Wrath for now although you may see her by my home in Austral Wollemian as well. I will not explain how I do this. I have been named Winterfell Ambassador by the Seneschelf. My duties: to represent her and the realm in all matters of foreign policy, to take the story that is Winterfell to places near and far. I am humbled by the honor and challenged by the opportunity. There is much to do and no time to waste. I must begin by presenting my credentials to the heads of state where Winterfell has embassies and, naturally, Caledon will be first. ‘Naturally’ as they are our sister nation in the Realm of the Roses and doubly so now because of their war footing. While these new responsibilities could weigh heavy at such a delicate time, I am thankful to have earned the trust and respect Miss Serra has shown in making this appointment as it gives me the chance, by way of service to our land, to pay my respects to her and what she has created here. Winterfell means so much to me. It completely changed my life. I will never forget the day I landed here nor will I forget how Winterfell so quickly pulled me close, arms tight around me and whispered in my ear, “Do you really want to go back to the Mainland?” I did not, I could not. I knew this land was my true home. I will do my best, I will give my all, I will not fail. High above Caledon sits an assemblage of airships of types this reporter has not seen previously. These ships are examples of the latest Steampunk technology. Equipped with advanced weaponry, the airships sit and wait for the day they will move to the front lines of a coming war. This squadron included an airship carrier and several support ships and aereoplanes. This reporter was told that this was only a small portion of Caledon’s air fleet. Working on a tip from a source close to the Caledon leadership, your correspondent was able to view the airships personally. I will not report the whereabouts of this squadron to avoid revealing military secrets. I can only say that each ship is in perfect condition. This reporter was also able to view a massive structure which appeared to be an airborne, moveable airbase. The base is known as the Iron Cloud. While Caledon’s air forces are said to be modern, large and ready, several sources have told this correspondent that the nation’s seagoing fleet pales in comparison. These sources say the naval force is small and in need of major technological improvements. Winterfell’s declaration of neutrality was challenged sometime late Thursday or early Friday when its most powerful military ship was attacked and partially sunk in its home waters. The Battle Star was heavily damaged in the surprising and daring attack as it was anchored in the Eventtide region of Winterfell. The Battle Star is the flagship of the realm’s High Seas Squadron. In a statement, the commander of Winterfell’s navy, Adm. Wildstar Beaumont said, “This was an unprovoked attack. The ship was peacefully moored and was showing the Winterfell national flag and not the battle ensign.” The admiral said engineers have recovered the hull and sent it to dry dock for repairs which will take several weeks. My old friend Seamus has moved into the guesthouse in Laudanum. He is “between parcels” on the mainland and will stay for a bit. He keeps threatening to move to Winterfell and live in a castle. I wish he would do it and have told him so several times. Mr. Quinquifid Oddenfen has Ms. Macchi worried anew. His work in another world has had an unintended and devastating result. She has asked me to counsel him should he be in touch. I did not ask why he would contact me before her. I visited Blue Mars again recently. I can’t think of any thing good to say about this world at this time. So annoying! This was my third visit. The first two were quite some months ago. I expected marked improvement. Just as before, even moving about is tedious. I have heard tell many times about a person’s objects disappearing from this world without warning, even things one assumes are safely put away. I have now experienced this phenomenon. My closet of Victorian clothing has been hit. I have not lost everything but a surprising amount and in a manner that follows no pattern. You shall see me in the shops. I will not be looking for Christmas gifts. New Babbage Said to Be Ready to Fight! The word of warning – “beware” – is most interesting as this reporter previously told you Caledon and New Babbage would be allies in this fight. That may still be true but the strength of such an alliance must now be questioned in light of Mr. Magic’s choice of words. I have contacted the New Babbage authorities to ask for a clarification of that nation’s role in this war. Most people I have spoken with so far about the war plans of Caledon seem to oppose it. Some of those I have spoken with are devout pacifists, some are neutral or opposed to this particular war, and others wish the ills of that other world would not invade this one. Although I was certainly excited to uncover and publish the news that war is in the planning stages and had initial thoughts about an active role for myself, I am heartened by this. Even in that other world, when I have supported a war, I have saluted those who oppose it, including those who oppose all war at any cost. I thank the higher power for the pacifists and I always will. Without them we might all be dead. Then there are those who simply do not care. Some have treated the news as ho-hum. They have seen Caledon go to war before and, if they were impressed by it last time – and many were not, they are certainly not so this time. Yet, I should add, general interest in the war is, in fact, high as can be gleaned by the increased readership of this publication since my initial war report appeared. I must say that I have been surprised by this strong and seemingly widespread reaction of opposition and indifference and have begun to wonder if there is enough public support to carry out a war. Some noted steamlanders have stated publicly that Caledon may regret war and that it could bring harm to the steamlands in general. Others have questioned whether the war might hurt Caledon but help other steamland nations. The economic impact of the war seems to be the concern in both cases. For myself, I have decided to be an observer rather than a participant. Although I think it would be quite interesting ((OOC: and fun!)) 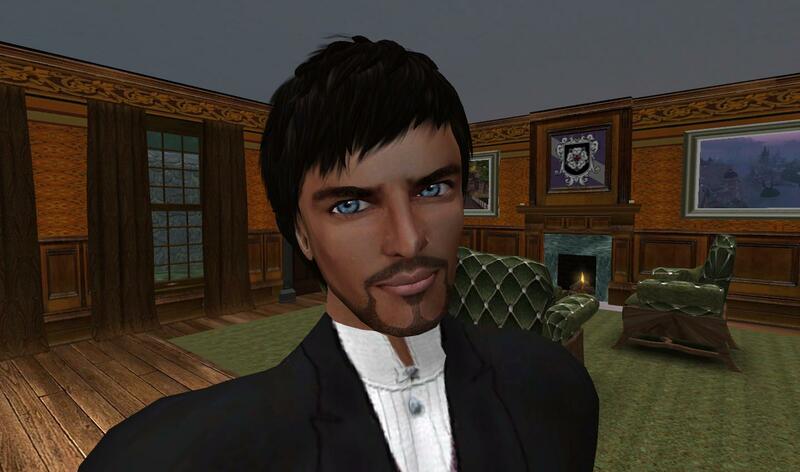 to be actively involved, I have homes in four steamland nations, one is Caledon, two have announced their neutrality, the other has made no announcement at all and given no hint that it ever will, choosing to ignore the matter entirely it appears. The most important view, for me, is the official view of Winterfell. I was not clear if her membership in the Realm of the Roses obliged Winterfell to take part but I am glad it does not. Unless Winterfell herself was attacked, it does not seem like a place that would ever be involved in war. It seems more a place to escape from such madness. Winterfell has her own madness…of a much more pleasant variety! I did feel an obligation to support whatever the view of Winterfell is on this war as it is my main home but even before I learned of Miss Serra’s decision to remain neutral, I had moved to the position on my own that I would simply observe and report. That is a position I am comfortable with and familiar with as well as it calls on skills I developed in another world. It will be interesting (and it is surprising) to apply them here.